In recent years, information systems have not been largely evaluated by their operating costs, but mainly by their strategic benefit and competitive advantage. As blockchain-based decentralized applications become more commonplace, representing a shift towards fully consumption-based distributed computing, a new mode of thinking is required of developers, with meticulous attention to computational resource efficiency. This study improves on a blockchain application designed for conducting microtransactions of electricity in a nanogrid environment. By applying the design science research methodology, we improve the efficiency of the application’s smart contract by 11%, with further improvement opportunities identified. Despite the results, we find the efficiency remains inadequate for public Ethereum deployment. From the optimization process, we extrapolate a set of general guidelines for optimizing the efficiency of Ethereum smart contracts in any application. 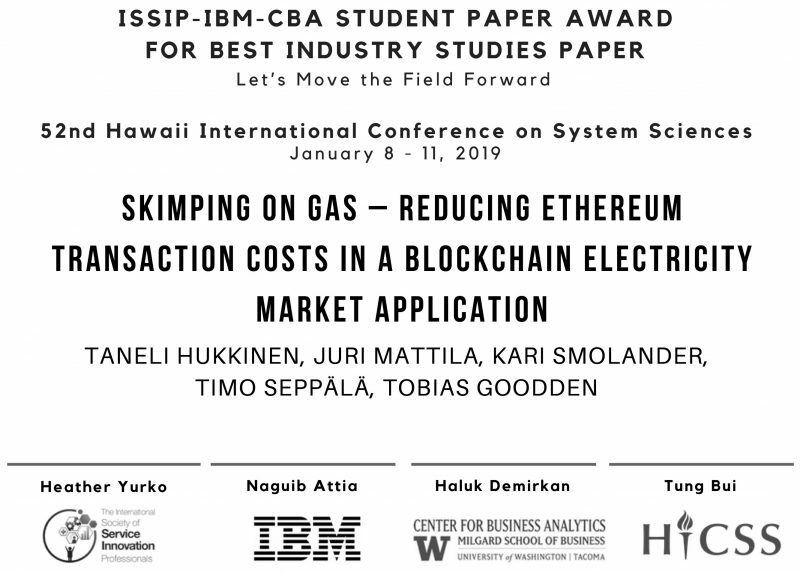 Proceedings of 52nd Hawaii International Conference on System Sciences (HICSS 2019).